If you’re feeling recurring pain at the side of your hip, you might have a torn gluteus medius. This muscle is attached to the greater trochanter, the bony protrusion at the side of the hip, and runs along the upper end of the hip. The gluteus medius is responsible for abduction, or the lateral movement of the legs from the body, and ensures that we stand straight and don’t limp while walking. Occurring after the muscle is torn from the greater trochanter, a tear in the gluteus medius prevents patients from walking properly, causing sharp pain and inflammation at the side of the hip whenever they attempt to put weight on the affected leg. The extent and severity of the condition will vary from patient to patient. Your orthopedic specialist can diagnose a gluteus medius tear by raising your leg away from your body to target the area of tenderness and weakness. An MRI may be useful in determining the extent of tissue damage. It will reveal if your tendon is stretched or torn, which may require surgery if your pain and weakness are severe enough. While a torn gluteus medius can cause considerable pain, there are some readily available treatments for immediate pain relief. In most cases, anti-inflammatory medications will alleviate the swelling and reduce the pain. Icing and gentle stretching can also provide relief. 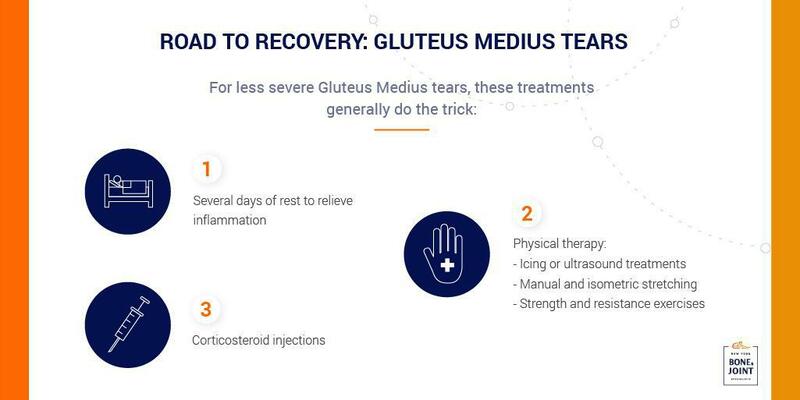 Treatment for gluteus medius tears will vary based on the extent and severity of the injury. In less severe cases, your orthopedic specialist will generally recommend several days of rest to relieve inflammation and irritation before beginning physical therapy. Your physical therapy regimen will likely be accompanied by a course of oral anti-inflammatories and a corticosteroid injection into the hip trochanteric bursa to alleviate pain during your recovery. The therapy itself will likely consist of icing or ultrasound treatments to calm inflammation, manual and isometric stretching to relieve stiffness and increase blood flow to the affected muscle, and, after several weeks, strength and resistance exercises designed to rebuild muscle mass and restore mobility. If pain persists after three to six months of these more conservative treatments, your gluteus medius may need to be surgically repaired. Surgery is generally necessary only when the tendon has been permanently lengthened or torn and cannot provide stability for the hip. Most gluteus medius tears can be repaired arthroscopically. 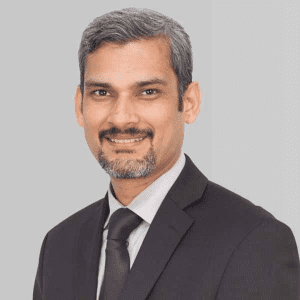 The procedure entails several incisions into the skin surrounding the muscle through which the surgeon views the torn muscle and operates on it, sewing the tendon back in place, removing permanently damaged tissue, and making other needed repairs. This outpatient procedure generally leads to a quick recovery period and greatly reduces the risk of scarring or other complications. 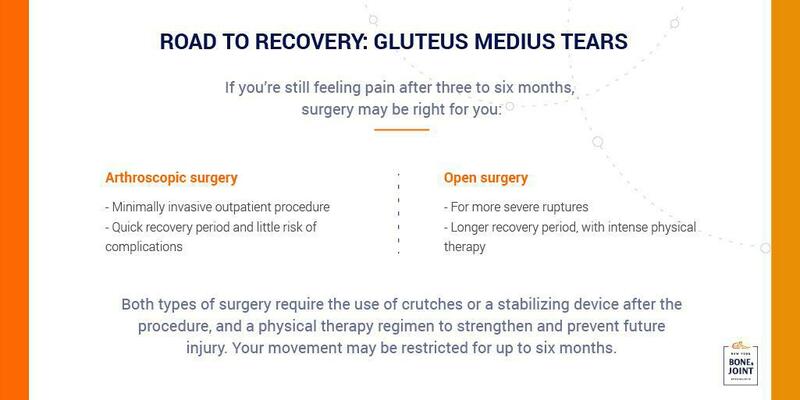 While most gluteus medius tears respond to these courses of treatment, more severe ruptures may need to be repaired with an open surgery during which your surgeon will use anchors to stabilize the repaired tendon. Open surgery has a longer recovery time, and patients will need more intense physical therapy to regain a complete range of motion. After surgery (whether arthroscopic or open), you will need to walk with crutches or a stabilizing device strapped onto your hip so that the repaired tissues do not become stretched out. While your movement will be restricted for at least six months, you will begin physical therapy within several weeks of surgery to stretch the gluteus medius. Physical therapy exercises will help keep the hip from stiffening, increase your range of motion, and prevent the growth of scar tissue. Later you’ll engage in strengthening exercises to support the healing hip and prevent future injury to the weakened tendon. Regardless of the severity of your tear, our seasoned specialists at New York Bone and Joint are committed to offering you the best in orthopedic care. With your long-term health in mind, we aim to ensure that you receive the most effective course of treatment.